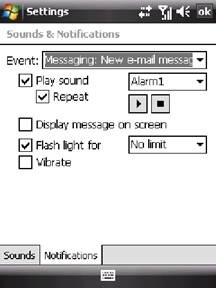 In Windows Mobile Pocket PC smartphone device, user can configure and set sounds and notifications alert for various events and activities that happening on the device. The notification alerts can be playing a custom selected sound, ring tone or tune, display message on screen, flash keypad light, or vibrate. And user can customize their favorite alert music audio and notification method for events such as incoming new e-mail messages, MMS messages, SMS text messages, missed call and voice mail the phone received. However, the notification alert for each event happens just once for one time. Supposedly, it’s possible to set the notification such as beeping and playing audio sound recurringly and repetitively until user acknowledge the e-mail, MMS, SMS or other events. 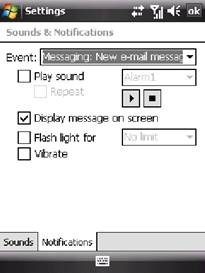 There is an option of “Repeat” for “Playing sound” in “Sounds & Notifications” control panel of Windows Mobile. However, the “Repeat” check box is always grayed out and disabled for most events, except few events such as Reminder. So user cannot select “Repeat” option in order to make notification alert recurring and repeat. There is registry hack that able to enable the “Repeat” check box in “Sounds & Notifications” control panel. To perform the change on Windows Mobile registry, a registry editor such as PHM Registry Editor, Mobile Registry Editor or CeRegEditor is required. There is a lot of registry sub-key inside the Notifications folder. Search through one by one to find and locate a registry entry that has its Default (REG_SZ) value as the name of the event. For example, Messaging: New e-mail message, Messaging: New text message, Messaging: New MMS message, Phone: Missed call and etc. Once found the correct registry sub-key that represents the event that you want to enable the “Repeat” option, edit the value data for Options value name. Change the value to 1073741835 (in Decimal base) or 4000000B (in Hexadecimal HEX base format). Save and exit from registry editor. Now the Repeat check box is enabled, and user should be able to set repetitive and recurring event notifications.